Powered by IntelÂ® Atom 1.5 GHz X86 processor, DLI 7200 enables retailers to deploy same POS applications that reside on fixed station terminals. IP54-rated unit includes 4.3 in. 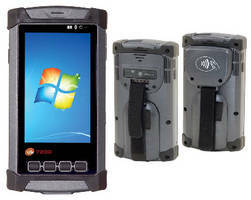 indoor/outdoor LCD projective capacitive touchscreen, 2 MP CMOS camera with flash, and 1D/2D CMOS imager barcode scanner. Built on standard PC architecture, DLI 7200 features optional OPOS/JPOS compliant 2-in-1 Payment Module; equipped to take magstripe and contactless payment through integrated RFID reader. LAPORTE, IN, USA - DLI (www.dataltd.com), a leading manufacturer of rugged tablets, in-vehicle computers, and mobile POS devices today announced the release of the DLI 7200 Rugged PDA. DLI unveils its new 7200 rugged PDA enabling retailers to deploy the same POS applications that reside on fixed station terminals, allowing for a singular PCI compliant operating system & application across the entire enterprise. Built on standard PC architecture, the DLI 7200 features an optional OPOS/JPOS compliant 2-in-1 Payment Module; equipped to take magstripe and contactless payment (NFCTM) through an integrated RFID reader, the 7200 rugged PDA increases your opportunities to capture the customer & complete the sale. The DLI 7200 rugged PDA has seamlessly converged voice & data into common interface on one device, eliminating the need for two data plans and two devices. DLI has revolutionized the mobile industry by blurring the industrial-consumer divide in its creation of this rugged PDA that not only survives the demands of a harsh industrial environment, but pleases the eyes of the discerning retailer with its sleek design. This rugged PDA has been independently tested & certified for multiple 4' drops to concrete and an IP54 rating for dust and water. Beneath its sleek exterior, the rugged PDA is powered by an Intel® Atom 1.5Ghz X86 processor featuring 2GB of memory and 64GB of available storage. To round out this robust PDA, the DLI 7200 boasts fully integrated GPS, WiFi, CDMA/GPRS and Bluetooth capabilities. "The Intel® Atom based 7200 rugged PDA solidifies DLI's market leadership position in the Enterprise Mobility space," said Joe Alexander, Sales Director. "The DLI 7200 provides the ability to run applications on a common OS platform regardless of form factor requirements." The DLI 7200 rugged PDA delivers the flexibility, reliability and return on investment that today's retail operations demand. Designed, manufactured in USA, the DLI 7200 rugged PDA will be available for delivery to both end users and resellers alike starting the end of Q2 2012.